After work today, I was finally going to make it out to Shawangunk Grasslands National Wildlife Refuge after work today to go for the DICKCISSEL that has been seen there in recent days. Little did I know that today would be an extra lucky day for me. 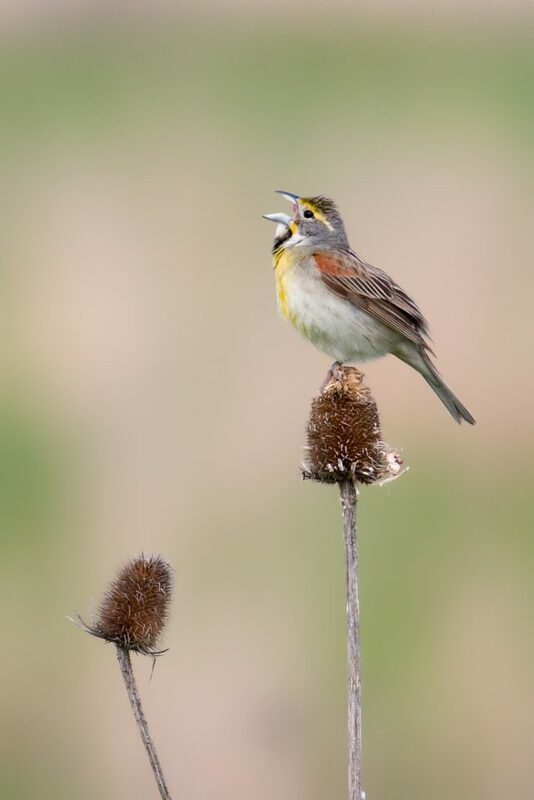 As I headed out towards the south blind, where the Dickcissel has been seen, I looked out that way and there was a relatively large crowd of birders there. This surprised me because I thought most had come for the Dickcissel already, but I continued to make my way out towards the crowd. 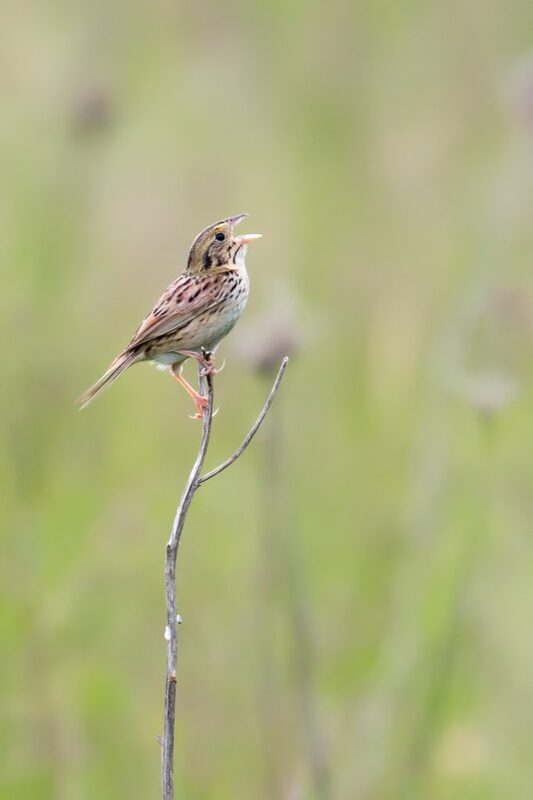 About halfway out, I got a text message from Karen Miller – they were on a HENSLOW’S SPARROW! That explained the big crowd! I picked up my pace and joined the group, many of which I ended up knowing. Shortly after my arrival, the sparrow started calling and then jumped up and perched nicely. It was so exciting! Meanwhile, I was still concerned about whether or not the Dickcissel was still around and I was assured that it was. 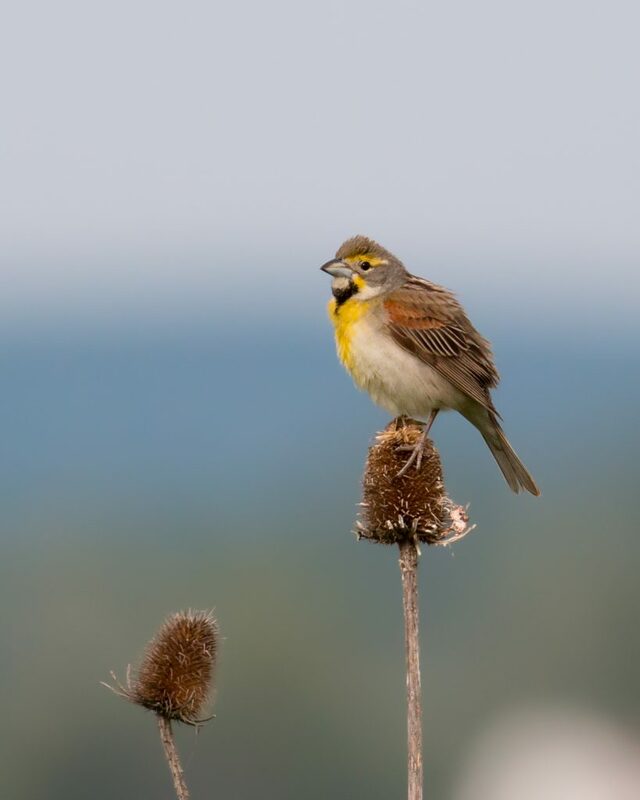 It wasn’t more than five minutes later that the Dickcissel made an appearance, perching nicely in the distance on a thistle. That made for 2 life birds in a matter of minutes! I certainly wouldn’t have predicted that this morning! As John Haas told me once – you never know when the next big thing will hit! Super exciting birding! Just one of the exciting aspects of birding! Congratulations on your lifers! Congratulations on your “lifers” and great images!!! I guess I “found” the bird and didn’t even know what it was at the time, a “funky” Grasshopper Sparrow hahaha ! Both birds were great and the musical background of the singing Bobolinks and Meadowlarks was surreal. Nature is never boring. I was able to get these lifers on Saturday, too. so they will stay with us!!!! Previous Previous post: Wow! Orange County CHAT! Next Next post: Camel Farm Shorebird Bonanza!